Tera Gold from Avatar weapon is a Tera online game system that allows players to obtain epic weapons for player’s leveling activities. Newly created Tera account will find this guide helpful especially on your early level. All the materials required to make and upgrade these avatar weapons are being obtain from mobs. While doing extra quest and avoiding on spending on items you don’t need will help you gain more gold. 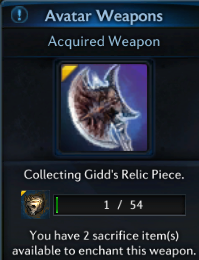 How to collect relics for avatar weapon and Tera Gold? To create an avatar weapon, you will need relic pieces that is being dropped by monsters ranges from level 16 – 59 zones and from dungeons. However, by reaching the level 60 you will no longer be able to create avatar weapons. Relics can be collected from the arms of the avatar quest and is automatically acquired by players who are level 16 onwards. While players who are level 20 will not be able to acquired the quest; but can still collect relic pieces, weapons shards and Tera Gold as normal even without the quest.